It's happened! The Red Bulls have won their first major piece of silverware in their history! 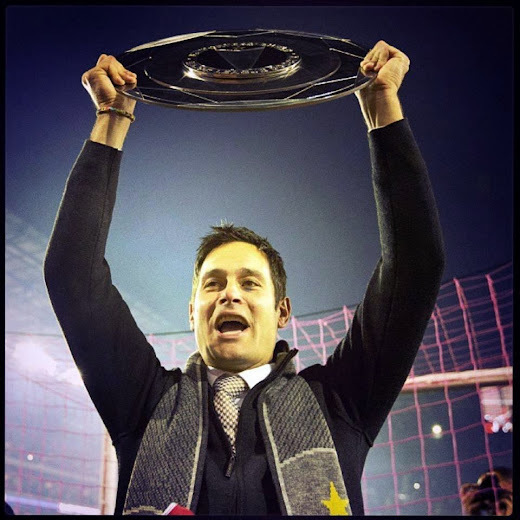 Yes, the Supporter's Shield (the great Mike Petke is pictured above holding it up) is ours this season. Our team needed to win and did it in grand fashion, with a 5-2 thrashing of Chicago (5 unanswered goals, after falling behind 1-0). This one was full of Golazos, so please see the video at the bottom for all the highlights. No matter what some people think, it means the Red Bulls were the best team in the regular season. It also comes with a place in next year's Concacaf Champion's League and a bit of Allocation Money ($100K?) as well. Tim Cahill has won his first major piece of silverware, Peguy Luyindula is on fire and the rest of the lads have a belief that I've never seen before in past MetroBull teams. What does this mean to me personally? I cannot begin to tell you how happy I am at the moment. The I've been following this team since 1996. I was there when Caricola stuck in that own goal at our first home game ever. I was there in October of 2003 when Chicago defeated us in that US Open Cup Final at Giants Stadium. I was there in November of 2008 when Columbus defeated us in that MLS Cup Final, at the Home Depot Center, in Carson, CA. This is beyond massive for me, mates! The great Mark Fishkin, whose Metro/RBNY supporting experience resembles mine (he's a 96'er as well), wrote a gem of a piece on what it means to him. Please do yourself a favour (mates) and check it out. Please see my videos on this page (parts I, II and II) for complete coverage of all the emotions we experienced on Sunday, October 27th, 2013. Please click here for my photo album (slide show here). Please click here for Matt Kremkau's photo album (slide show here). So curses have been lifted, 17 past seasons of mediocrity have gone down the drain and we're, apparently, favorites to win MLS Cup. No matter what happens in these playoffs, we've broken our Silverware Cherry. It's Champagne Wishes and Caviar Dreams for us long suffering RBNY fans! That's it for moi, mon amis! I hope to see you all for the return leg of our 1st round MLS Cup Playoff series @The Cathedral of Football, Red Bull Arena (built by Makita). The big viper is outta here!